Warning: This post might be partisan! On this election night…my dinner. 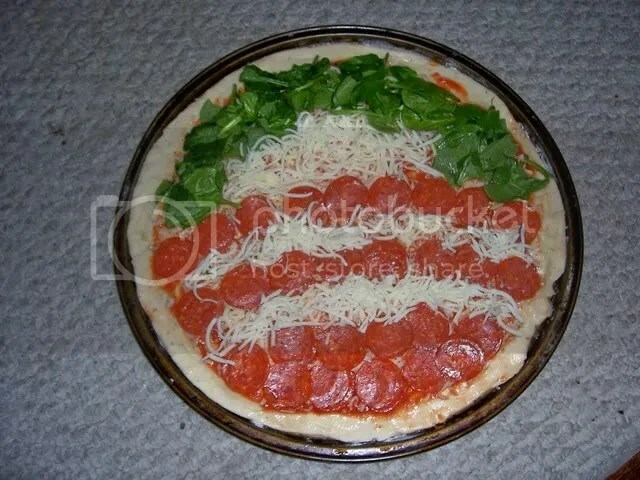 And even if this pizza design is not palatable to your political tastes, the crust recipe is still tasty. The other day, I had a craving for a Calzone. I had no rhyme or reason for it; it’s not the type of thing I usually want or even order at a restaurant. I just made it up as I went along, and it turned out pretty tasty. Traditionally these are fried, but I made a baked version. I had previously made pizza dough in the freezer. The recipe is from my coworker, Brittney. I have no idea where she got it from, but it’s mighty tasty and freezes well. Her recipe is below. Rice also has a great no rise recipe. Dissolve the yeast in the warm water. Let it stand for 10 minutes, until slightly bubbly. In a large bowl, combine the flour, salt, olive oil, honey, and cold water. Add yeast mixture and stir to blend. Knead by hand until smooth and glossy – about 10 minutes. Form into a ball and place dough in an oiled bowl, turning to coat entire surface. Cover with plastic wrap and and towel and let rise until doubled in bulk – about 1 hour. Long gone are the days of eating Tortino’s Pizza rescued from the darkest reaches of my freezer. Even gone are the days of decent store-bought brands or most delivery or carry-out ones. These days I make my own pizza, and it’s not too hard and tastes really, really good! 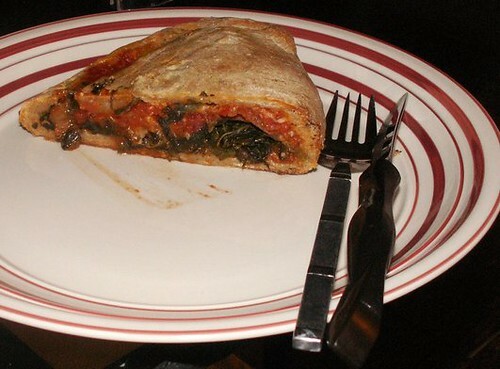 I like to think of this homemade pizza as “healthy” (as opposed to “health”) food because it is not swimming in the cheese grease common in slices found at your local pizza joint (and I top it with spinach and mushrooms, at least on one side?) At the very least, the control it affords allows you to decide how much and how many toppings you want. The most important part of this pizza recipe is the dough. I tried a few different recipes but they were often too thick or too bready for my taste. 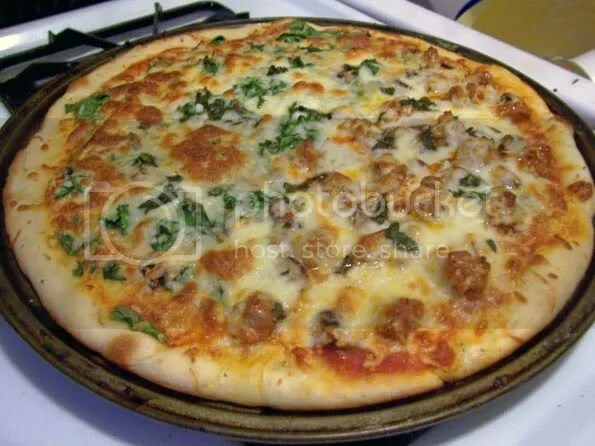 Perhaps good for those who like thicker crust pizza, but I wanted something more in between–not quite cracker-thin, but just a little bit soft and chewy. Also, this dough recipe is quick and easy: The ingredients are few and there’s no wait time for dough to rise–you make it and roll it out and there be pizza! Please note: I’ve tried this with wheat flour and it’s just not as good. The dough is a little too tough. If you want to try a healthier dough, I would recommend going half and half with the white and wheat flour.